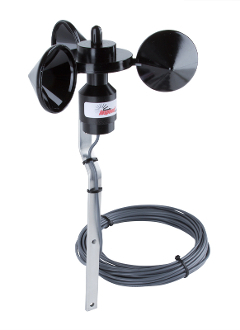 Rugged wind sensor handles speeds from 5 to over 125 mph. The Version II is taller than the "Classic", and has several options - metal tube mount, metal rotor, and is available with a reed switch or optical sensor as well. The internal PCB allows customers to use their own wire if they want to (also saves on shipping weight if you provide your own wire!). This version includes a Hall sensor that provides one pulse per rotation. Comes with exterior grade wire (click add to cart to see standard wire lengths), custom lengths available on request. It is designed to provide very accuracy at an affordable price - with a sapphire/tungsten carbide bearing system for super low friction and long life. Output: 1 pulse per rotation, 2.5 mph/Hz. Power required: 3 to 24VDC (microamps).